This is the story of how people in Quebec are trying to save turtles ― one cell phone photo at a time. TIFFANY CASSIDY (HOST): This is the story of how people in Quebec are trying to save turtles — one cell phone photo at a time. CAROLINE GAGNE: They don’t have the same space to breathe or to live in as before. DEBORAH POWELL: You feel as though you’re giving back. And when you get so much from nature, you want to be able to give back somehow. TIFFANY CASSIDY: You’re listening to Nature Talks: the Nature Conservancy of Canada Podcast. Fascinating stories about nature, why we need it in our lives, and the passionate Canadians helping to protect it. I’m Tiffany Cassidy. This is episode seven — Why the Turtle Crossed the Road. DEBORAH POWELL: That is the Ottawa River, Rivière des Outaouais, Kitchissippi — pick your language. TIFFANY CASSIDY: Every morning Deborah Powell walks to the Ottawa River that’s near her house. Deborah lives in Norway Bay, an hour’s drive west of Gatineau, Quebec. DEBORAH POWELL: Can you think of a better way to start your day? DEBORAH POWELL: Than go for a walk! TIFFANY CASSIDY: This morning’s walk isn’t just a peaceful ritual. Deborah has her eyes peeled. She’s looking for turtles along this shore. DEBORAH POWELL: It was right here, just about there that I found the baby map turtle, which was all of about that big. TIFFANY CASSIDY: Like a few inches. DEBORAH POWELL: Oh! Like seriously, I put my keys beside it just to give it…it wasn’t the size of, you know, a key. And where mom had managed to make a nest…that they’d managed to hatch out, that they’d survived over the winter and all that sort of thing. It just, I was totally awestruck. Helped him the last 20 feet. DEBORAH POWELL: Or her into the water. It was pretty sandy and tired looking. But this is more the kind of stuff that they like. TIFFANY CASSIDY: This kind of rocky sand? DEBORAH POWELL: Yeah, you’re into a kind of gravel. TIFFANY CASSIDY: Northern map turtles like the one Deborah saw have lines on their upper shell that look like a map. That’s how it gets its name. And this turtle with the nifty-looking shell is in trouble. It’s officially at risk in Quebec and across its range in Canada. Which means the northern map turtle is in danger of disappearing altogether here. And it’s not the only turtle in trouble. All of the freshwater turtle species in Quebec have been assessed as at risk across Canada. Including the snapping turtle. DEBORAH POWELL: It is pretty funny, ‘cause when the swimming lessons are on here and the snapper shows up, everybody screams, jumps out of the water. TIFFANY CASSIDY: The poor misunderstood snapper turtle. TIFFANY CASSIDY: The snapper is the largest freshwater turtle species in Canada. The average snapping turtle shell is 30 centimetres long — about the size of a loaf of bread. It looks a bit like a dinosaur. Grey-brown body and shell, spiked tail and beaked mouth. But as Deborah points out, it’s really quite shy, and snaps its mouth in self-defence. For all its primitive, fierce appearance, the snapping turtle is no match for modern transportation. TIFFANY CASSIDY: Roads are deadly to turtles. And we often build them in low areas and along lakes and rivers, right through the middle of turtle habitat. Why does a turtle cross the road? In spring, adult turtles set out to mate and find nesting sites. 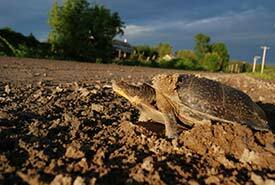 In late summer and early fall, newly hatched turtles travel from nest to a nearby wetland or water body. And more and more, they are crossing roads. And while a turtle’s shell can protect them from predators, it’s no match for a car. Caroline Gagne is a program director for the Nature Conservancy of Canada in west Quebec. CAROLINE GAGNE: They do cross roads and it’s an issue because they are very slow. They are turtles, so people don’t really necessarily notice them. TIFFANY CASSIDY: There’s one right now. CAROLINE GAGNE: There’s one right now. TIFFANY CASSIDY: Turtles are “freshwater janitors.” They clean things up by eating dead fish. And they push through plants, making channels that fish and frogs will move through. Which is one of the reasons why conservation experts like Caroline are so concerned about their survival. CAROLINE GAGNE: I usually take an example, as if you see the ecosystem as a plane: if you start removing bolts and pieces, eventually your plane will crash. If you remove a species here and there, including the turtle, it becomes really problematic to the equilibrium of the ecosystem. So as a specific role in nature, the turtles will clean the water. They will eat bugs and things that humans really don’t like. So they are really part of the chain that maintains the stability of an ecosystem. TIFFANY CASSIDY: Cars aren’t the only threat to turtles. A lot of factors are causing their decline. Including habitat loss. CAROLINE GAGNE: They don’t have the same space to breathe or to live in as before. So these species have existed since the dinosaur era, they’ve been there before us, so we’re currently destroying their habitats. TIFFANY CASSIDY: The Nature Conservancy of Canada works to protect habitat for Canada’s species at risk. And that includes turtles. But Caroline and her colleagues knew that wasn’t enough. When a turtle is struck by a car, it can have a bigger impact than just the loss of that one turtle. Studies show just a five per cent increase in annual mortality can put an entire population at risk of decline. CAROLINE GAGNE: They reproduce very late in life. Some species take up to 25 years to reproduce. And the success rate of the eggs is very low. So maybe two out of 100 eggs make it to be an adult turtle. So their biological strategy is based on longevity. That’s why every adult in a population counts. TIFFANY CASSIDY: To make matters worse, many of those killed on roadways are females searching for sites to lay eggs. To do more to protect the turtles, Caroline needs more information. Where are the ‘’hot spots” where turtles are seen? Where is prime turtle habitat? Where are they most often being killed on roadways? The Nature Conservancy of Canada could never gather that much data province-wide by working alone. Enter, citizen science. CAROLINE GAGNE: Instead of paying 10 biologists for two weeks on the road trying to focus really hard on a certain area. It helps us still get the same kind of data. It gets validated, so the quality of the data is there. TIFFANY CASSIDY: Conservation in the age of the internet and the selfie. After this break. TIFFANY CASSIDY: The Nature Conservancy of Canada is a national charity. We protect important natural areas for the species that need them — species from northern map turtles, to humans. How much do you know about Canada’s reptiles and amphibians? Take our quiz and learn more about our work go to natureconservancy.ca/podcast. That's nature– c-o-n-s-e-r-v-a-n-c-y.ca. TIFFANY CASSIDY: We don’t tend to think of turtles as migratory animals. But they do migrate — just not very far, or very fast! In Quebec, turtle populations are in trouble. And roadkill is a big part of the problem. The Nature Conservancy of Canada has turned to citizen science to give the turtles a break. They reasoned, if our modern lifestyle was part of the problem, maybe technology could be part of the solution. And so they created the website Carapace.ca. Carapace is a French and English word for “shell.” And they appealed to Quebeckers to report turtle sightings, dead or alive. Remember Deborah Powell in Norway Bay? DEBORAH POWELL: I think that the whole citizen science thing is wonderful because it gets people feeling they can do something. TIFFANY CASSIDY: When Deborah sees a turtle, she snaps a photo. She uploads the photo to an online map at Carapace.ca. It identifies hot spots of where turtles are found. Gathering the data is the first step. Then the information is reviewed and verified by Caroline and her team of experts. CAROLINE GAGNE: Everyone wins. And the public is more informed about the turtles. So we do more than just the work that biologists would do. TIFFANY CASSIDY: The Nature Conservancy of Canada is particularly interested in identifying hot spots near roads. TIFFANY CASSIDY: And they’re learning a lot. The project launched in 2016. The next year more than 850 turtle sightings were reported across the province. And it looks like there will be even more reports for 2018. The Carapace project is on its way to compiling vital information that can lead to action. CAROLINE GAGNE: So we might be able to put in place actions that will help to protect turtles. So either put up signs of turtle crossing on the roads. Really make a difference for the turtle populations in Quebec. TIFFANY CASSIDY: The Quebec Government is already keeping an eye on the project. TIFFANY CASSIDY: Olivier Trudel is searching the Carapace website. He’s a biologist working for the Ministry of Forestry, Wildlife and Parks. OLIVIER TRUDEL: I’m consulting the database and we can see that this spot represents the concentration of turtle mortality. And we can keep it in sight for the next year and see if the trend is continuing to build up. TIFFANY CASSIDY: To date there has been very little data on when turtle populations started to decline. OLIVIER TRUDEL: The population trends are not well known in Quebec. TIFFANY CASSIDY: The Quebec government is doing its own structured surveys, but the information from Carapace.ca will help them target specific areas for conservation. That could mean installing fences to keep turtles off the road, building wildlife crossings so turtles can move safely, or asking people to leave their lawns a little longer so as not to damage turtle nests. Carapace.ca — and the people contributing to it — is making a difference. OLIVIER TRUDEL: The species are kind of emblematic for wetlands, so I think that if we do a conservation action and if we succeed at one day to re-establish, to make them recover, I think this telling a lot about our society and our values evolve in time. TIFFANY CASSIDY: On Deborah Powell’s morning walks, she takes time to enjoy nature around her. Whether it’s the turtles here or the turtles she sees while driving along the road. She maps where they are, and hopes it helps others to learn more about how to protect the animal. DEBORAH POWELL: When you get so much from nature, you want to be able to give back somehow. TIFFANY CASSIDY: And Deborah’s hoping her efforts play a small role in turtle recovery, for the sake of all nature that depends on them. DEBORAH POWELL: Nature is the wealth that surrounds us, it’s the power that grounds us, it’s the absolute wonder everyday of looking at things. TIFFANY CASSIDY: Before we wrap up: would you help a turtle cross the road? Here are a few quick tips from Caroline Gagne. Step 1 – Make sure it’s safe to get out and help the turtle. Do not try this on a busy highway. Step 2 – Check the direction it is going. Always help it continue in that direction. Step 3 – If it’s this small, colourful, calm turtle, you can carry it to the side of the road. Carry it close to the ground — you don’t want to drop it. You’ll know it’s a snapping turtle if it’s grey and really big. These ones bite. Don’t pick it up. If you have a car matt or a shovel, carefully slide the turtle onto this and drag it across. Or grab the back of the snapping turtle’s shell… tilt it up on its front legs… and wheelbarrow it across, letting it walk on its front feet. Step 4 – Back away, and let the turtle be. You don’t want to cause stress. To learn more visit Carapace.ca – c-a-r-a-p-a-c-e.ca. TIFFANY CASSIDY: The Nature Conservancy of Canada does amazing things — like inspire citizen scientists to help turtle recovery. This work is only possible because generous people like you donate. If you would like to support this work, go to natureconservancy.ca/podcast and click on the big orange donate button. All amounts make a difference. TIFFANY CASSIDY: Like what you heard on our podcast? Subscribe to future episodes on your favourite app. Give us a tweet [bird tweet] using the hashtag #NatureTalksPodcast. Share it with a friend. Or email us at podcast@natureconservancy.ca. And if you're looking to explore the amazing places we talk about on this podcast, go to natureconservancy.ca/podcast to see our sites that you can visit. Thanks to Deborah Powell and Olivier Trudel for sharing their stories with us. Thanks to Caroline Gagne for her expertise, and everyone at the Nature Conservancy of Canada who put this together. Some of the birds you heard were from the Macaulay Library at the Cornell Lab of Ornithology, from recordist Geoffrey A. Keller. And our theme music is by Carly Dow – NCC staffer/musician. Find her at carlydowmusic.com. I’m Tiffany Cassidy. Thanks for listening.